A natural dye is anything that is derived directly from the natural world that can be used to color a textile. The first synthetic dye was discovered by accident in 1856 using a coal tar byproduct. For all of human history before that, humans had been finding ways to harness color from the natural world using plants, roots, flowers, berries and even insects. The above photo was taken when Earthen Warrior founder Susanna Taylor went to learn about traditional natural dye techniques from Zapotec weavers and dyers in Teotilan del Valle, Oaxaca, Mexico. The art of natural dyeing takes patience, time and love. Each plant has its own chemistry, and thus its own specific way of behaving as a textile dye. Almost every natural dye listed below carries multiple beneficial properties. One of the exciting things about natural dyes aside from the color, is the human and environmental benefits of each natural substance. As long as the dyestuff is harvested or foraged responsibly, natural dyeing can be an act of healing and environmentalism. If you are interested in learning more about natural dyeing, check out the EVENTS page. 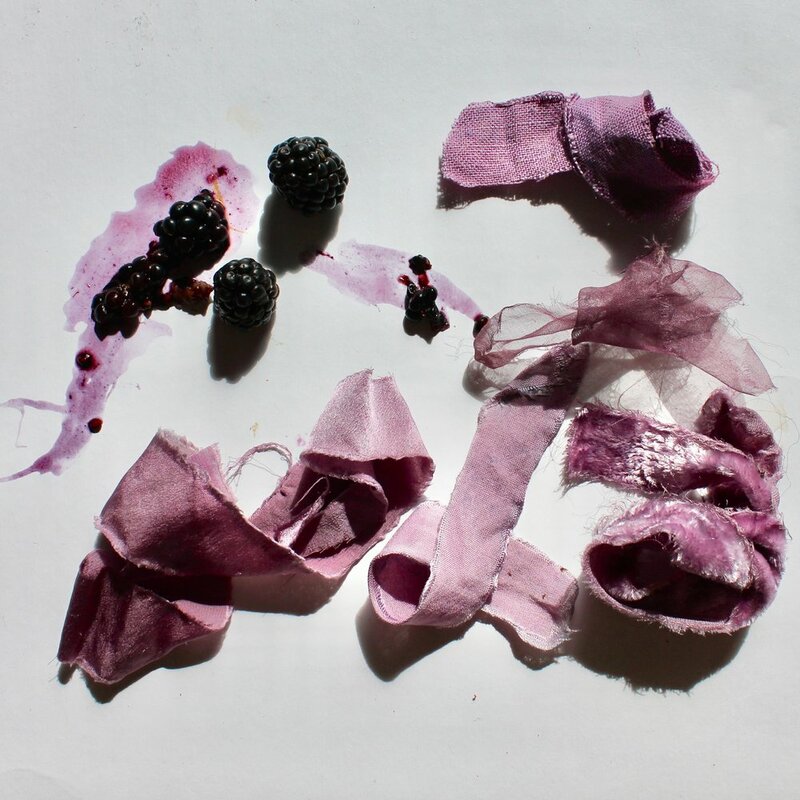 Susanna teaches a variety of natural dye classes in New York City and beyond. Little research has been done about the health effects of wearing chemically-sprayed cotton, chemical dyes and petroleum-based polyester on our skin (the largest organ of our body, and an absorbent one at that). We venture to guess that it isn't a health-enhancing practice. Instead, we look to healing roots, flowers, barks, wood, berries, fruits and leaves to provide us not just with color for our textile, but also the accompanying compounds and properties which can enhance the health of the wearer. The same benefits that a flower petal imparts for the whole flower, is then imbued into the fabric, and we benefit from that synthesis. Most plants have properties that protect them from the elements and pests, so when we use this to dye fabric, we then have a product that is more resistant to moth invasion, and can help our own skin heal with antioxidants and other fortifying properties. The pits can make pink, tan, peach and terracotta colors. The lac dye comes from a resin emitted from the lac insect, which is indigenous to Southeast Asia. The berry of the raspberry plant yields a blush pink color. Raspberries have been shown to have anti-inflammatory properties which can soothe the skin. The quebracho dye comes from a tree indigenous to South America. The heartwood and bark are used to make the dye. The pits can make “peachy” pinks and tans. The sandalwood dye comes from the heartwood of a tree which grows in Southern India and the Philippines. Cochineal dye can yield pink, red and purple. The dye comes from the shells of the Cochineal beetle that feast on Prickly Pear cactus. The flower of this plant yields a pinks and reds. Hibiscus is beneficial for the skin and hair and when taken as a tea has many internal health benefits. Madder is a root that grows easily in many conditions. It can yield pinks to a deep, earthy red color. Also called Annnato when used as a food coloring and known as Urucum in Brazil. It is the bright red seed of the plant which yields an orange or peach color. Cutch dye comes from the heartwood of the cutch tree, native to Asia. The skins of an onion make varying shades of yellow and gold. The leaves of the marigold flower yield a range of sunny colors from butter yellow to deep orange. The root, both fresh and in powder form, make a vibrant yellow dye. Turmeric has been used for thousands of years as an internal and external medicinal preparation..
Osage dye comes from the heartwood of the Osage Orange tree. It is a lightfast sunny yellow dye. The flowers can be used to make a yellow dye. It has been used medicinally for hundreds of years for its many properties which soothe the skin and accelerate healing. Goldenrod flowers make a bright yellow that is wash fast and light fast on textiles. It grows abundantly in the NE US during the late summer and fall. Pomegranate skins will yield an earthy army green color. It can also be used as a mordant. Fresh Indigo leaf mixed with cold water and ice will yield a beautiful seafoam green/blue color. The leaves of the rosemary plant can be used to make a yellow green dye. When iron is added as a modifier, you can achieve a grayish, sage green color. Sage leaves create an electric green color or a light yellow-green depending on the fabric. Less potent cousin of indigo. Can produce blues and greens. Indigo dye comes from the leaf of the Indigo plant. It is unique from all other natural dyes for its color and the process by which the dye is prepared. The soaking water of dried black beans can make blues, purples and grays. This flower, sourced from Asia, yields periwinkle and blue. With added acid such as lemon, it will turn purple. The leaves of the red cabbage plant can make periwinkle, lavender and icy blue colors. Logwood dye comes from the heartwood of the tropical Logwood Tree. It yields many shades of purple, from lilac to a deep plum. The berry of the blackberry bush yields pinks and purples.